On Saturday, October 2, the late Sonny Sharrock will have a street named for him in his hometown of Ossining, N.Y. 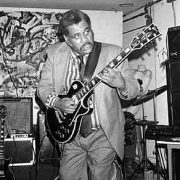 In a ceremony presided over by Ossining’s mayor, Bill Hanauer, South Malcolm Street will be renamed “Sonny Sharrock Way” in honor of the jazz guitar pioneer. The Sons of Sharrock, a band led by Sharrock’s cousin Kendall Buchanan, will perform at the event.